When you see this Strawberry Bread, all puffed and brown, cooling on its rack, you could be fooled into thinking it is a yeast bread. Cut into it, though, and its taste and texture will tell you otherwise. This Strawberry Bread is a 'quick' bread which means it is leavened by baking powder and baking soda. I love how it has the flavor of summer, bursting with juicy sweet strawberries. It is delicious cut into thick slices, with or without a slathering of butter. 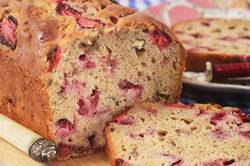 Strawberry Bread is made a little differently than other quick breads that are just stirred together in one bowl. This bread is similar to a cake batter; that is, the butter is beaten with the sugar, the eggs are beaten in, and then the dry ingredients are added alternately with the sour cream (or yogurt). You can use either full fat or reduced fat sour cream or even a plain yogurt. Once it is put in the oven, it is baked until its crust is golden brown and a toothpick inserted in the center comes out clean. Since fresh strawberries are available year round, you can make this bread any time of the year. For maximum flavor, though, use fresh strawberries with lots of flavor. Cut them into small pieces so they won't drop to the bottom of the pan during baking. And you may want to toss the strawberries in a couple of tablespoons of the flour from the recipe as this will also help prevent them from sinking to the bottom of the pan during baking. Strawberry Bread: Preheat oven to 350 degrees F (180 degrees C) and place the oven rack in the center of the oven. Butter and flour (or spray with a non stick vegetable/flour spray) the bottom and sides of a loaf pan (9 x 5 x 3 inch) (23 x 13 x 8 cm). Place the nuts on a baking sheet and bake for about 8 minutes or until brown and fragrant. Remove from oven and let cool completely before chopping coarsely. In the bowl of your electric mixer, or with a hand mixer, beat the butter until softened (about 1 minute). Add the sugar and continue to beat until light and fluffy (about 2-3 minutes). Add the eggs, one at a time, beating well after each addition. Beat in the vanilla extract. Scrape down the sides of the bowl as needed. In a separate bowl, whisk together the flour, baking powder, baking soda, salt, and ground cinnamon. With the mixer on low, add the flour mixture (in three additions) and sour cream (in two additions) alternately, starting and ending with the flour. Mix only until combined. Gently fold in the diced strawberries and chopped nuts. Scrape the batter into the prepared pan and bake for about 60-70 minutes, or until the bread is golden brown and a toothpick inserted in the center comes out clean. Place on a wire rack to cool and then remove the bread from the pan. Serve warm or at room temperature. This bread can be frozen. Junior League of Portland, Oregon. Portland's Palate. Portland, Oregon: 1992.